One more step, please complete the security check to access a site, may be displayed to you when you try to access certain sites on the Internet. This happens to me a lot when I connect the device to a virtual private network or Tor. Usually, it means clicking on the "I'm not a robot" box first, and selecting images showing specific types of objects afterwards. You may be asked to select all images with grass, house numbers, or store fronts. Depending on CloudFlare's algorithm, you may be done after selecting them on the first screen, or new images are loaded that you need to select matching images from as well. But what if the captcha is broken? What if there are no images with store fronts, trees, or recreational vehicles left, but the captcha claims there are? Hitting the verify button returns the error "please also check the new images". This you cannot do because there are not any that match the criteria. While you may be tempted to select a random image in this case that resembles the required type the most, you may end up decreasing your "not a bot" score doing so. You have two options to deal with the issue. First, you may hit the reload button at the bottom left corner of the captcha interface to get a new challenge. This loads a new challenge and resets everything so that you can start anew. While it adds to the time it takes to solve the captcha, it is a valid option to solve it and get the site in question to load. You may also hit the F5 key on the keyboard or click on the reload button instead on the page for the same effect. The second option is to switch to audio challenges. This is the second button at the bottom of the screen. The challenge lists words or phrases, and asks you to pick those that match a category the best. For instance, you may be asked to pick phrases that match creating content, private operator or important resource. Since it uses the same system as the image captcha, there is a chance that you may not be able to solve that captcha either. You may go back to the image captcha at any time with another click on the button. The report a problem link won't help you right away, but you may use it to report captchas without a valid solution. This may help CloudFlare optimize their content better and reduce or eliminate the problem completely. I ran into captchas without valid solution more often in recent time. While they are few and far between, it is an annoyance that CloudFlare should get a grip on and resolve as it is frustrating. Another thing that I would like CloudFlare to do is find a way to display a "are you a real human" check only once for a browsing session, and not every time you load a new site protected by their service. Firefox users may check out CloudHole for that, a third-party solution that aims to make this more user friendly by re-using cookies. 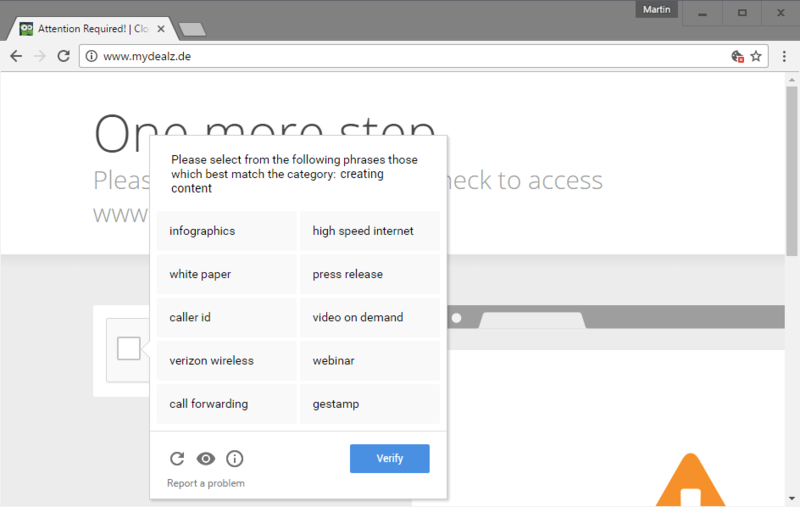 Find out what you can do if the captcha code displayed to you cannot be solved when it is displayed while you are trying to load Internet sites. Previous Post: « What is eBay Plus? 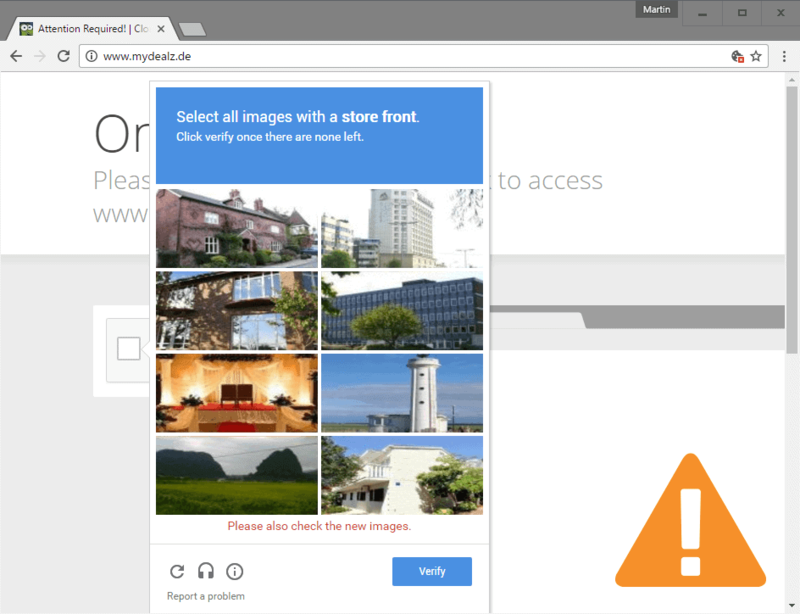 I ran into one site with a custom captcha where the images came from a blocked source. So of course the images were blocked. Just turn your ad-blocker off temporarily. I usually just close the site tab once I see the crap. If it happens more than three times, then I no longer visit that site. I’ve got other things to read and see. My primary browser is Pale Moon x64 with NoScript and uBlock Origin (among other extensions). Even when I temporarily authorize all scripts on the page and disable uBlock Origin on the site, I’ve been running into broken Cloudflare captchas pretty often recently, on an open (non-Tor) connection. (Instances that I can remember involved signing up for online management of a credit-card account, submitting an information request to a hardware manufacturer, and registering for a forum.) Sometimes no instructions show up at the top of the captcha graphic (e.g., “Click on all pictures containing mountains”), sometimes no pictures appear, and the alternative audio captcha that’s supposed to dictate numbers for you to type doesn’t run. There’s only so much time I’m willing to put in to try to make captchas work, and when I can’t, I fire up plain-vanilla Google Chrome to get through the captcha and go back to Pale Moon as soon as possible … provided other features on the site aren’t also broken in Pale Moon, which is also starting to happen more and more often. It’s becoming a significant annoyance. I don’t think it’s a Pale Moon problem; I can confirm it happens in regular Firefox too. Captchas just don’t play nicely with script blockers or properly secured about:config pages. I have come to learn that if I get a captcha, it’s usually not worth my while to try to make it work. I either (a) open it in a clean Chromium session like you do, or, more likely, (b) leave the site and never return. I can’t be bothered to waste time with captchas. It’s reassuring (in a very disappointing kind of way) to know that it happens in properly secured Firefox, too. As I mentioned, I’ve been running into an increasing number of sites and features that I can’t get to work unless I run them in plain-vanilla Google Chrome, and I’m pretty unhappy about it. I only bother when I either have to or really want to visit the site. Doesn’t like my VPN? Skip. Doesn’t work without an obscene number of third party scripts? Skip. Too difficult to figure out which security setting is conflicting with the site’s bad design? Skip. Keeps popping up boxes asking me for feedback / my postal code / talk to a live agent now? Skip. However, occasionally the bad websites win. For example, I have temporarily given up insisting on TLS v.1.2 encryption, because I’m encountering far too many sites that only support v.1.0 (prominent sites that ought to know better). And when I want to book tickets for the opera, I unfortunately know I must launch the vanilla Chromium because the theatre’s website is crap. But it’s a big internet, and a website better be pretty darned important to me if I’m going to put up with nonsense rather than look for an alternative. That form of captcha is infuriating for someone with a visual impairment like me. I literally cannot look at those little images and see which ones have grass or street signs or bodies of water. It may be a really good way of fooling a bot, but it’s also really good at fooling people that can’t see well. At least with text captchas you have a chance. Some of the photo captchas are a real challenge for those of us with theoretically corrected vision. (“Hmmm. Are those cookies, or are they crackers? Is that a river, or is it part of a lake? Is that a street sign, or is it some other kind of sign? Is that a storefront, or is it the entrance to a government office? Is that a flower arrangement, or is it a fancy salad? Is that a castle, or is it just a manor? Are those olives, or are they really dark cherries? And is it true that tomatoes are technically a fruit?”) I hate them. I love the “not a robot” images when I have to select Pizza. At least the captchas are getting creative. I am kind of logical person and when I see something like “Select all images with cars. Click verify once there are none left.” with an exemplary image of a car that IS NOT selectable… I find the task impossible. That’s one of the first things they should fix here. My problem with captchas is that the criteria requirements at the top of the page are nothing but a thin blue line. So I have to guess if the want street lights, cars or buses since I don’t know the criteria. It seems to be a firefox rendering thing. 2/3 or the time I end up refreshing. google (who owns CAPTCHA) is now (2019) trying to punish people who use a VPN. They claim it is to weed out spam and bots, but common sense says they want to gobble up the VPN market just like they gobble up everything else. have wasted many hours trying to log in to accounts to post a comment on a news story. google is ruining life online with its lousy C APTCHA. Companies/sites need to STOP using C(r)APTCHA! It drives people away from your sites/companies/products. Dump it! I’ve mitigated the Captcha headache by no longer visiting websites that use it. Problem solved.